Breathlessly, I sat there with my pupils amply dilated as M.L. Sirichalerm Svasti, better known as Chef McDang, regaled me with stories of what a typical meal time was like at Sukhothai Palace. Sure, you can find secondary, tertiary, quadriary accounts anywhere about dining in the palace by those who know — or think they know — about the subject. But, you see, I was listening to a first-hand witness who spent more than a decade of his youth at the scene. And in many ways it is as if I was in the presence of an extant papyrus manuscript detailing historical events. The exception, of course, is that this manuscript is interactive. Suddenly, I was reduced to a wide-eyed little girl sitting cross-legged — a fluffy stuffed animal in her tight embrace — listening attentively to a story of the enchanted castle. “A typical dinner lasted about two and a half hours,” said Chef McDang. My eyes grew cartoonishly bigger by the minute as he reminisced the dinner scene presided over by his great-aunt, Queen Rambhai Barni. The meal, said the queen’s nephew, started off with soups and appetizers, and was followed by the main course all of which were delivered daily from Chitralada Palace kitchen per His Majesty the King’s gracious directive. This Western meal was served Russian style with butlers presenting food on silver platters to the Queen first before moving on to the other people at the royal table. Wait a second. Western meal? Served Russian style? There goes the myth about the palace being the place to look for ironclad authenticity in terms of cuisine or about the royal cuisine being a separate class of its own (more on that in this CNNGo article). Of course, traditional Thai food was part of the royal dinner. Once the western meal was finished, the Thai meal commenced. The whole samrap (สำรับ), an entire ensemble of various dishes for the whole meal, was set separately for Her Majesty. The gap khao (กับข้าว) — the dishes to be eaten with rice — he recounted, were never placed on the same plate with or on top of the rice (as done by street vendors). The dishes served were regular Thai fares put together to form a varied yet balanced Thai samrap that consists of a clear soup, a curry, a stir-fry item, a deep fried item, a salad, and an indispensable nam prik (chili relish) with all its accompaniments. “The rest of us were served Russian style. The table would be reset for each one of us with a plate for rice and a half moon-shaped plate to the left of the the rice plate for all the various dishes.” And if there were soups or curries, said the chef, they would be served individually in small bowls with ceramic soup spoons. “The butlers were the ones serving you the rice and you could just glance at them for more rice and more gap khao and they would bring them to you,” he said. And I sighed. With me growing up on the wrong side of the palace wall, my glances — even my stares regardless of how intense and meaningful they were — fell on whomever was around the dinner table like a bunch of dud grenades. After the completion of the savory meal, the table would be reset first for Western desserts then fresh fruits, followed by traditional Thai desserts. As usual, the Queen would have her own samrap of fruits and desserts while the other people, McDang included, were served Russian style. Asked which dish served at the palace he liked the most, Chef McDang recalled how much he loved the quintessential summer dish, Khao Chae (ข้าวแช่), the dish that is traditionally served during the dry and hot season to cool you down. I could hardly hide the grin on my face for, you see, finally — something we have in common. To make Khao Chae, inside or outside of the palace, rice in jasmine-scented iced water is carefully prepared and served with assorted savory delicacies. Most Khao Chae ensembles in the various palaces in the olden days consisted of the usual accompaniments which were more elaborate in the way they were prepared. Take one of the most popular Khao Chae accompaniments, stuffed banana peppers in wispy egg shrouds, for example. “Some palace cooks would steam the stuffed peppers first before deep-frying them and wrapping them in the egg threads,” said Mcdang. Everything else was also meticulously prepared. Vegetables would be peeled, cut into bite-sized pieces and beautifully carved. Fruits would receive a similar treatment. No pits, seeds, peels, or stones would be found on the fruit platter. Yet, in terms of the food itself, what was served at Sukhothai Palace is the same as what you would find anywhere in Thailand. “Most people think that royal cuisine is different from regular Thai cuisine and that there is something very grand and magical about it,” said Mcdang. That couldn’t be further from the truth. “The myth that royal Thai cuisine is different than regular Thai food is created by the marketing minds who wanted to charge more money for Thai food,” he added. What makes palace food special lies in the fact that the cooks in the olden days used the best raw materials and took great care in making sure that the food tasted balanced and there were no extremes in flavors. That is to say, the food wouldn’t be too salty, too sweet, too sour, or too hot. There’s a bit of a surprise, however. “I remember the Queen even had her own rice steamed in an earthenware crock and it was red rice,” recalled Chef McDang. With that, the oft-repeated theory of the unpolished red rice being consumed exclusively by citizens of the lowest class and the more refined white jasmine rice being reserved for those belonging to the upper crust of the society is crushed along with the notion of the royal cuisine being different from the regular Thai cuisine. “Authentic” is a word that we all have used without being able to clearly define. I still haven’t been able to grasp just what “authentic” means, and my quest for clarity has not been very fruitful. When it comes to cuisine, “authenticity” is to me a word that is — at a risk of sounding intoxicated — both loaded with meaning and meaningless at the same time, depending on how you look at it. While there’s nothing harmful in that, Chef McDang dismisses the methodology of such undertakings as misguided. A mortar and a pestle – the most important tools in Thai cooking. To truly understand what Thai food really is about, one needs to adopt a bird’s eye view of the entire span of known Thai history and capture the elements which form a theme that runs diachronically. That theme is the framework of Thai cuisine which, in turn, defines it. Oh, how many times have I heard that in recent weeks? There are two major rules and one exception to authentic, traditional Thai cooking according to McDang’s theory. Salinity is derived from fish sauce; sweetness from palm or coconut sugar; sourness from locally-available tropical fruits, e.g. tamarind, green mango, lime. The use of soy sauce for salinity or vinegar for acidity is all a result of late foreign influence. One cannot cook Thai food without making a kreung tam (เครื่องตำ) or a paste regardless of the cooking technique. Just as the French have their grandes sauces or sauces mères (mother sauces), the Thai have our pastes upon which various dishes are built. The exception to the rule is when you make a soup that is an infusion (which is akin to making tea). Tom Yam, Tom Kha Gai, etc., all fall into this category of pasteless dishes. The cooking techniques found in Thai cuisine are quite simple, McDang has pointed out. The most basic and prevalent technique is grilling. This explains why there are so many Thai words for different types of grilling. Also, since the beginning of time Thais have only had clay pots to cook with. It was not until the beginning of the Rattanakosin Period, when the presence of Chinese immigrants became more prominent, that we started to cook with a wok which is essential for stir-frying and deep-frying. Over the ages, Thai cuisine has undergone changes along with the changes in social milieu. Yet, we can see how the aforementioned two rules have continued to govern the way in which Thai food is traditionally made. We can also see how the flavor profile remains the same. We’ve borrowed extensively from our foreign neighbors and visitors, but we have continued to operate within the same framework. The players may change or grow in number; the rules remain unchanged. In other words, according to McDang, authenticity has nothing to do with antiquity but everything to do with the governing principles which are transcendent and timeless. In light of this, we don’t need to stay stuck in a certain era or regard the dishes prevalent in that era as the prototypes of Thai dishes. “There is a definitive Thai cuisine if you know these rules and stick by them,” said McDang. 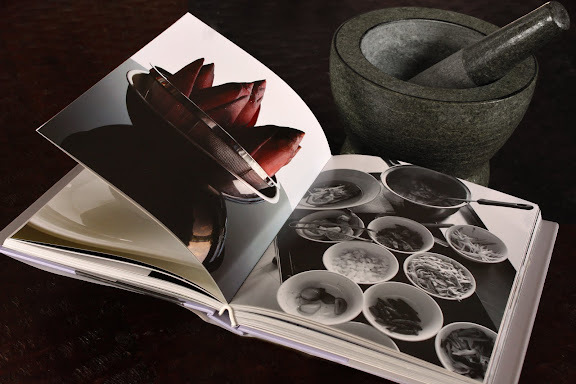 “This is important for most Thai cooks to understand because if they do, they will be able to create new Thai dishes based on the governing principles.” The structure provides a solid framework within which imagination and creativity operate. Modern Thai dishes can be created, even with ingredients from other parts of the world, and they will still continue to manifest the profile of Thai cuisine. In The Principles of Thai Cookery, McDang’s first English-language book, the chef has explained his theory on the fundamental elements of Thai cuisine in a much more lucid and plenary manner. This self-published book, which has recently made JP Morgan’s reading list, represents a long overdue “textbook” on Thai cuisine that Chef McDang had spent years writing. It needs to be said that The Principles of Thai Cookery is not your typical cookbook. It is unlike any other book on Thai cuisine in that it is not prefaced by everything there is to know about the history and geography of Thailand, a well-worn strategy to establish credibility (often at the expense of relevance and bordering on over-compensation). Neither is it a collection of every recipe available in print physically bound together — pertinence be darned — to form a gigantic concordance. 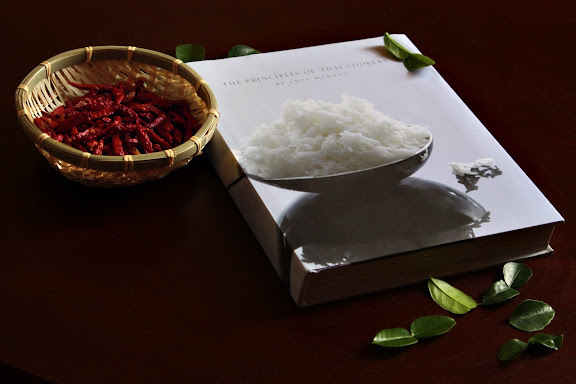 The Principles of Thai Cookery is a fluff-free book containing only pertinent material arranged thematically with a framework securely in place. Insights into the food history, the culture, and the Thai way of eating take the place of gratuitous information. 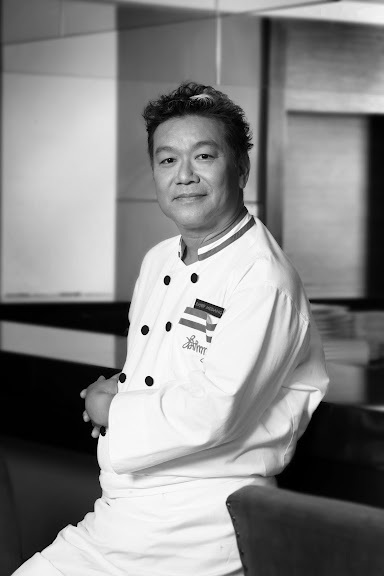 Chef McDang, a graduate of Culinary Institute of America, is a strong advocate of teaching Thai cooking through science and the kind of pedagogy employed in premier culinary institutions worldwide. Cooking is not a mysterious, cultic thing that is to be passed on through rote memorization of ingredients and procedural steps; cooking is science and, therefore, should be explained accordingly. The Principles of Thai Cookery is arranged according to cooking techniques. If you see this book as a cookbook, this may seem rather strange. But when you take into consideration that this book that contains nearly 60 essential Thai recipes is first and foremost a textbook, such organizing principles make sense. I like this book. A lot. And I recommend it wholeheartedly to any Thai food lover or anyone who wants to understand the basic tenets of Thai cuisine. I asked McDang which recipe in The Principles of Thai Cookery was his top favorite and he was sort of rolling his eyes at which point I realized I’d foolishly asked someone to identify which of his kids was his favorite. A stubborn negotiator, I refused to back down. Finally, I succeeded at irritating him into telling me which of these 57 recipes was the most interesting dish to feature with this article. “Hor Mok,”  the chef made his pick. Why? It represents a dish that is not Thai in origin, but has been adapted to fit into the framework of Thai cuisine in such a way that we now have a dish that is decidedly and uniquely Thai in terms of flavor profile even though the influences of the Indian, the Moor, and the Portuguese are undeniable. Something about the name, Hor Mok, sent chills down my spine. No, I don’t hate the dish; I love it. I was just reminded of those days when my paternal grandmother would make me grate coconut with the coconut rabbit while she scraped the flesh of fresh chitala chitala (ปลากราย) off its spine bones in the process of making Hor Mok. One of my aunts would be pounding the curry paste. Once I was done with the coconut, she would extract the coconut cream out of it. And, oh, boy, did I ever know what would happen once I dismounted the bunny. The fish meat would go into a clay pot along with the pounded paste, some duck eggs, and coconut cream. And sulkily I would sit there — pot in lap — and stir the fish mixture counter-clockwise until my right arm was just about falling off. The fish mixture would get fluffier and more viscous towards the end while my resentment grew. But it was necessary, said Grandma. Unfortunately, she left it at that. Without the explanation, all that stirring felt to me like a cultic ritual performed to appease a kitchen god. But, no, it’s all about science. Hor Mok is nothing but Western-style fish mousse flavored with curry paste and thickened with coconut cream as opposed to cream. Also, instead of being formed into quenelles and poached, the curried fish mixture is steamed in banana leaf cups or packets. What about the whole stirring stuff in the clay pot business? That’d better serve some lofty purposes, because — let it be known — at least a quarter of my childhood was spent with a clay pot in my lap while I stirred my life away. “When you make fish mousse, everything must be kept cold,” said Chef McDang. “This prevents the protein in the fish from stretching and creating an unpleasant, grainy texture.” That makes sense. A clay pot is probably the only thing that would do the trick in the pre-refrigeration days. Grandma, are you reading this? I’d like to express my heartfelt thanks to M.L. Sirichalerm Svasti for graciously granting me the interview. I am a grateful recipient of the knowledge imparted through his book, email messages, and a lengthy conversation. Despite his privileged upbringing, Chef McDang exhibits no trace of arrogance. Not only is he approachable, he’s also funny as heck. The interview with him is by far one of the most — if not the most — entertaining interviews I’ve ever conducted with anyone. There were moments when I learned new things, moments when I was corrected in my thinking, and moments when the chef made me laugh so hard apple juice came out of my nose. For all of those moments, I thank him. Disclosure: SheSimmers.com is not in any way related to ChefMcDang.com. The positive review of The Principles of Thai Cookery has not been motivated by any kind of compensation, monetary or otherwise. 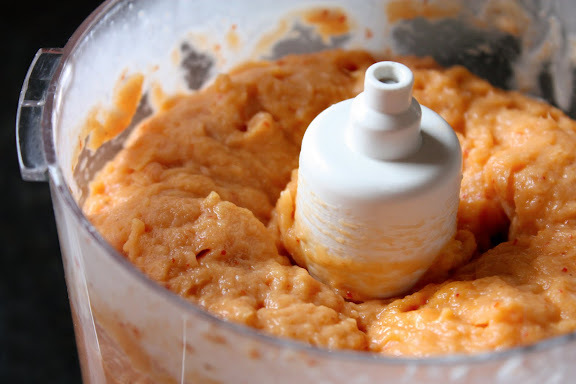 Place half of the fish cubes, the egg, curry paste, palm sugar and fish sauce into the work bowl of a food processor. Turn on the food processor and let it rip (remember that everything has to be cold). Once the fish starts to ball up, add the cold coconut cream while the machine is still running. This will create a creamy mousse and the consistency can be controlled by the amount of cream you add – it’s just a personal preference. Taste the mousse. It should be salty, slightly sweet and creamy. If you prefer not to taste it raw, fry a dollop of the mixture in a non-stick pan, then taste. Adjust seasoning according to your preference. Add half the julienned kaffir lime leaves to the mixture and blend further. 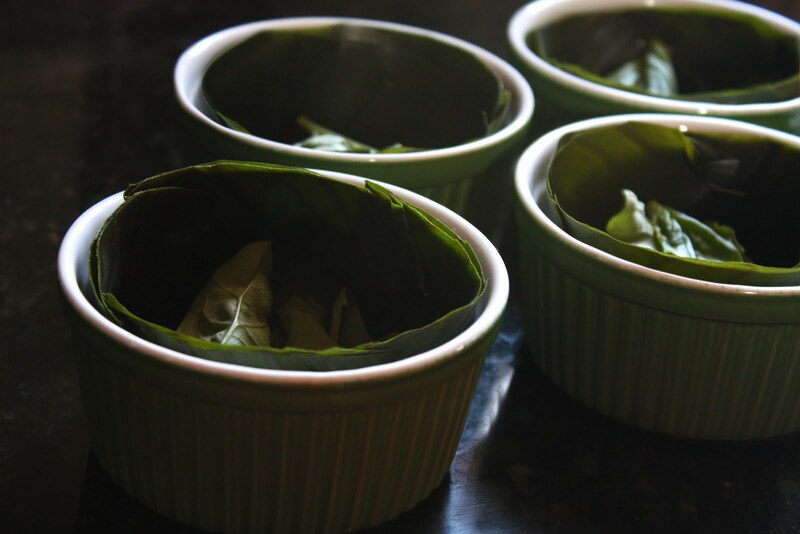 Distribute the Thai sweet basil leaves evenly along the bottom of each banana leaf cup. Place the remaining fish cubes on top of the sweet basil, then fill each cup with the prepared mousse. Heat one cup of coconut cream with the rice flour in a saucepan until it thickens. Spoon over the contents of each cup and garnish with the rest of the kaffir lime leaves and the julienned red chili peppers. Place cups in the steamer and steam until done (usually ten minutes). Serve either hot or at room temperature with rice. During a Russian-style banquet, trays are presented to each guest and they serve themselves from the trays. Also spelled Ho Mok or Haw Mok. Personally, I’m not a fan of using the letter “r” as a mater lectionis, but Hor Mok is by far the most prevalent spelling and, therefore, used here, albeit reluctantly. In the old days, wild-caught fresh-water fish had unpleasant smell to them and a paste of fresh herbs and spices would be the only way to counteract that muddy smell. Ho Mok is one of my fav things to cook… but… I can not do the little cups so that they are neat and tidy + not leak too much! Can you in the near future do a photo demo (or video!) on how to make the banana leave cups? i have so much trouble making them… not sure if I sure use staples or not. etc. I just purchased this book last week and have been madly in love with it! I even purchased another copy as a gift for my mother. It’s so beautifully done and a great tribute to our kingdom’s cuisine. I’m so glad you are helping publicizing it on your site! More people need to know about this great book. Thanks for another great post, Leela! Chef McDang’s (um, how does that read in Thai?) and your insights into what are the principles of Thai cooking was particularly interesting. I was recently looking up material/articles for ecamples of “cultural leadership” the other day, admiring how European Chefs “กวาดรางวัล” (sweep up)the prizes of World’s Best Restaurants, and I’ve been scrutinizing El Bulli’s chef, Ferrian Adria. I found myself wondering why Thailand doesn’t have a world class Thai Chef. I don’t know if we need one, but one would be nice. Is it because of how our cuisine is prepared and served? Or is it because our chefs were trained/cultivated differently? Thai restaurants can be posh, elegant, exclusive, with excellent services, by why not world class? Hmm, national egoism speaking maybe. It sounds a lot nicer to let the food processor do the work than stir this by hand. It’s great hearing about how the royal meals were served, and I’m glad the Queen ate poor-man’s rice. I’m going to purchase this book, it sounds simply amazing, and I hope it is only half as good as this amazing interview and post you offered us. How wonder, you have me inspired once again to explore something new and wonderful in Thai cuisine. “Thais don’t have a world class chef. The reason being is, as a society we take our food for granted. There is no propensity to gather as a team and market or promote our national food. Moreover, in Thailand we tend to operate under the idea that foreigners are better and so turn to westerners for promotion or because there is no one else they can work with as a team. Unfortunately, at the moment Thai restaurants in Thailand are created as a means of support and income. Food is not the main focus of the restaurants. Therefore, there are no institutions or books that genuinely promote the actual structure of Thai food in a disciplined scientific way. An excellent insight into the never ending discussion about the ‘authenticity’ of Thai food (if there’s such a thing) Personally I do prefer David Thompson’s ‘Thai food’ to McDang’s as it seems less edited and capture a more spontaneous, wide ranging view on Thai Cuisine. I also find David’s wealth of knowledge to be very inspiring. I find Nui’s comment a very valid one. Why are no Thai restaurants in the top 100 of the best restaurants in the world? I think it all comes down to the double edged sward of the pursuit of authentic cooking. If we really look at the top 10, we’ve got very non traditional, innovative approach to food, Ferran Adria , Heston Blumenthal, Inaki Aizpitarte, René Redzepi just to name a few. There’s not going to be any prizes for executing a traditional thai ‘Khao Chae’ to perfection. And I think it’s this adherence to traditional cuisine, and doing things ‘traditionally’ not necessarily because it’s the best way, but because it’s the way it has always been done, that stops Thai food from becoming a world class cuisine. Even ancient Thai cooks adopted new techniques and recipes, why can’t we? We can continue to make truly authentic Thai dishes that Thai people enjoy, that’s all fine and good. But if other palettes from around the world are unable to enjoy it then what’s the point? Pete – Great points. I don’t agree with all of them, and I don’t think what McDang is saying is that Thai food is or should be static. If anything, he is saying that with a set of principles in place, there is still lots of room in which you can have fun making Thai food with new ingredients and presenting it in new ways. Thai people have done that for ages: adapting new ingredients and techniques from other cuisines. His new book, if I’m not mistaken, is going to be about how to present traditional Thai dishes with traditional, recognizable Thai flavor profile in modern ways. So, no, nobody is saying that Thai food should be static here. Speaking of strict adherence to traditional recipes, isn’t it Thompson’s book for the most part a collection of classic recipes that aren’t even routinely consumed in modern times any longer? I’m wondering how you think of that as being more spontaneous. The food at Nahm is also presented in a very classical way as opposed to, say, Sra Bua by Kiin Kiin where you get foams and spheres. I think Thompson and McDang are essentially on the same mission, i.e. 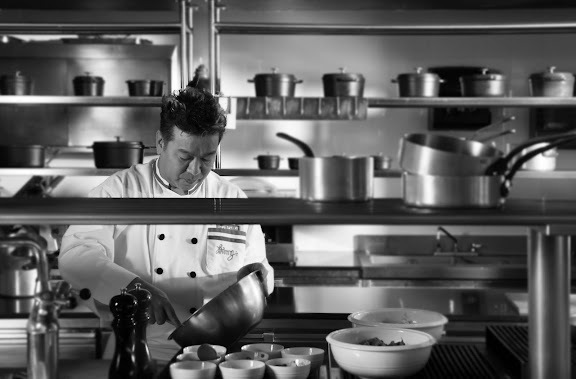 preserving the integrity of Thai food. One is doing that by adhering to a set of principles (which still allows for freedom and creativity); one is doing so by cloning classic recipes from the last century (nothing wrong with that). Also, I have to mull over your comment about how making traditional Thai food is pointless unless we cater to the international palates. My first reaction is why? Are you saying that unless a cuisine, any ethnic cuisine, changes and morphs to the point where it’s embraced by all palates, it’s, as you say, “pointless.”? Is universal acceptance and appreciation the raison d’etre of a cuisine? It’s a complicated subject for sure. And though I don’t entirely agree with you, I see where you’re coming from and appreciate your input. Perhaps a follow-up post on this is in order. Pete – One point I missed: Is the goal to make the kind that Thai food that an institution like Michelin can readily understand and appreciate? I see your point, but I’m wondering if it would be more fair to classic ethnic cuisine chefs and restaurants to push for Michelin critics to educate themselves about the various ethnic cuisines and their uniqueness in order to judge intelligently and fairly. Wouldn’t this be what we should push for instead of rallying for Thai chefs to turn themselves en masse into Blumenthal, Adria, et al in order to gain international recognition. I’m not against the idea. Just wondering. Leela, I just discovered you a few days back and have not read thru everything here yet. I do not know if you have addressed it elsewhere. My wife & 2 Sons are allergic to fish. I do not know the world composition of people allergic to fish. I grew up eating fish 7 days a week. If I make Thai at home, I use salt instead of Fish sauce and all four of us can have a happy meal. PS. Glad I found you! I also recommend salt to people as fish sauce substitute, Vijay. In my opinion, soy sause works mostly in Chinese-influenced dishes, such as stir-fries and deep-fried dishes. When you work with traditional Thai dishes, soy sauce fails. If the Michelin inspectors can’t be arsed to learn the nuance of Thai cuisine, or whatever cuisine for that matter, then screw them. If other palettes [sic] from around the world can’t appreciate a cuisine for what it is, well, then screw them too. Thai chefs, stand your ground. You don’t need validation from a tire company. If you keep being all things to all men, then you’re nothing. It’s this drive to be universal that makes us lose our uniqueness. I shudder to think that one day people won’t recognize a classic dish like tom yum even if it hits them between the eyes. So I’ll keep it short for this one.. The conclusion I drew was that ultimately it all came down to getting that ‘balance’ right, which depends on context, intention and the audience. Imagine a Michelin inspector sitting on the floor crossed legged eating ‘Nahm prik kapi’ with their bare hands, served in a handmade ‘kratong’ and having their palettes numbed by the ‘spiciness’ of Thai food. Imagine a Thai grandmother sitting at Sra bua trying to get her head around a deconstructed ‘Dtom yum’ served in a martini glass, with a price tag of 5000 baht at the end of the meal. Ultimately I think there’s a valid point for both approaches , classical vs contemporary, it just depends on the intention of the chef/ restaurant. And I think it also depend greatly on their intended audience which is very specific to each approach. while Nahm & Bo.lan like it to be classical. If we go the traditional route, do we have to start reviving ancient recipes and start growing ancient long lost variety of vegetables? Start cooking on coals, and bring out the rabbit every time we want to make a curry, for it to become ‘truly authentic’ This also brings up the question can Thai food cooked outside of it’s original context (Thailand) ever be authentic? If we go for the contemporary Michelin approach do we have to start using free range, organic, locally grown, seasonal, artisanal produce? In terms of Thai chefs turning themselves en masse into molecular gastronomists. I think most classical Thai chefs don’t really care about Michelin anyway. Because I don’t think they believe Michelin or top 50 restaurant to be a true judge of classical Thai cooking. And from what I’ve seen, the top 50 never really reward any restaurant for perfectly replicating a classical dish, they like to see more innovation and creativity than that. And a Mussamun curry of braised lamb shank or Panang curry or plar Salmon served in a restaurant in Thailand won’t win them over either, as the ingredients are not sourced locally or seasonally. I do think that there is room for both intentions in Thai cuisine to coexist harmoniously and personally embrace both, having a degree in culinary arts in NZ, having worked in a contemporary kitchen as well as collecting ancient Thai cookbooks & funeral manuscripts and pounding curry paste in my grandmother’s kitchen since I was 7. Here I am giving you an earful again! Thank you very much for the open discussion na kub. I think that it’s a subject both dear to our hearts and will look forward to your follow up post on this wonderful subject! Pete – Thanks a lot. Great conversation. In some way, I agree with Daniel who posted a comment just above your most recent comment, although I’m clearly not as, uh, passionate as he is. Your comment on reviving ancient vegetation and such makes me think that perhaps you’re not familiar with the criteria for “authentic” Thai cuisine which McDang has proposed in this interview. His theory is that as long as the flavor profile remains Thai (and that’s achieved by using the ingredients all of which are readily available in the present time), it’s Thai food. Thompson, on the other hand, has taken a different approach which is more in line with what you seem to think of when speaking of authentic or traditional Thai cuisine. From what I’ve heard, one of the recipes in McDang’s new book is going to be Hor Mok made into a timbale. Is it traditional? Maybe not if traditional means it must be cooked in a banana leaf packet and eaten with bare hands. Does it represent the flavor profile that is consistent with Thai cuisine? He says it does. Personally, I don’t think the real issue is whether or not we can please Michelin. Institutions come and go; their judging criteria change over time. What hurts me is when people do not recognize that Thai food can be elegant, expensive, and put in the same class as western cuisines. This is why our chefs are reluctant to invest their career excelling in classical Thai cuisine. There’s no monetary reward. It’s a career suicide. Until we learn to banish the false notion that Thai food is pedestrian and supposed to be cheap, we’re never going to care enough to reward the talented chefs among us. And if we do, there’s little need to adapt our cuisine to please the palates of Michelin or anybody for the sake of winning their approval. I think that’s the main issue. In the long run, I think it’s better for us than to perpetually change things to please the so-called universal palate (which I don’t think exists.) We need to take care of our Thai chefs and reward them. but at the same time Thai people will NOT pay high prices (by Thai standards) for a Thai meal, because they feel that they can get Thai food at a fraction of the price. But they are happy to pay high prices for european high end restaurants. The fact that its hard for people to recognize thai food as expensive and elegant, comes down to the fact that Thai people living in thailand don’t buy into that idea themselves, I think that’s where it breaks down. As you know Thai people always are in favor of ‘farang’ things as they are they view them to be ‘high class’… Just have to look at the rate people are opening cafe & bakery. While Thai dessert is on the verge of being extinct. Are there any culinary schools out there teaching students to make curry pastes from scratch anymore? I do believe that ultimately it is the Thai people that determine the future of Thai food, more specifically the new generation, and judging by the ever growing thirst for ‘arharn farang’ the future is not in good hands..
Pete – I completely agree with you. interesting discussions, but really only one thing matters – The food has to taste good! Hello Leela – thank you very much for your recipes, and the one for Hor Mok in particular. 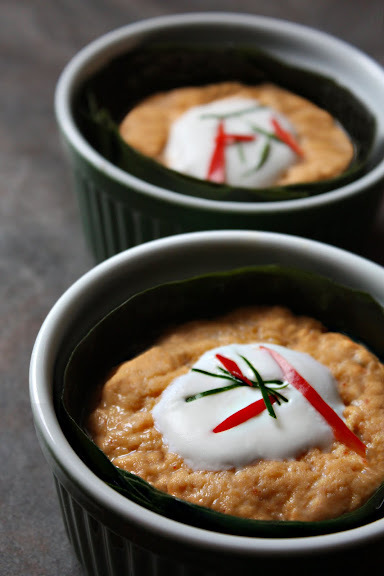 I have prepared it several times – for my Thai friends – who own and run a couple of Thai restaurants locally – have received rave reviews – and requests for Hor Mok often! I usually increase the curry paste, fish sauce and palm sugar quantities by about 25 percent. I now want to make the hor mok in the shell of a young coconut. Do I need to do anything different? For how long should I steam the filled coconut shells? Should I first steam the empty shells so that the absorb some heat, then fill, then steam again? Any suggestions or advice would be much appreciated. Thank you.